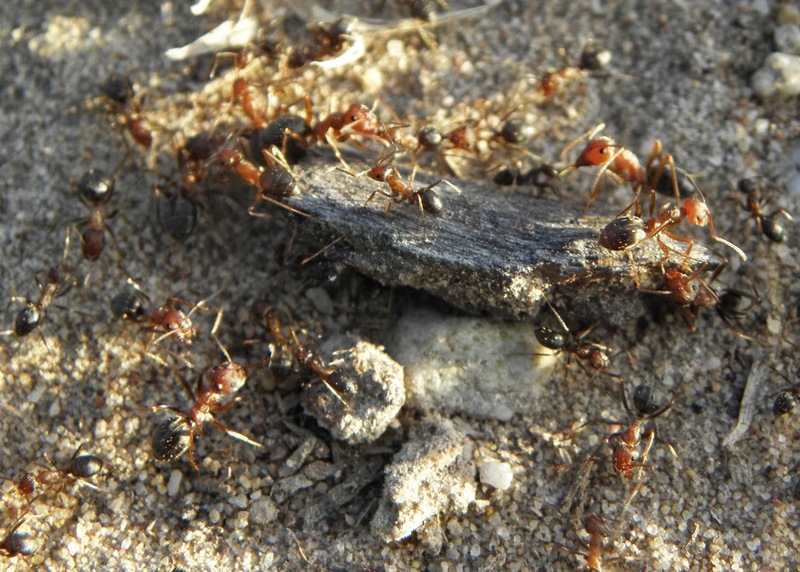 From both an ecological and an economic point of view, ants of the genus Anoplolepis are amongst the most important ants in the Western Cape. They are fast-moving, very aggressive ants that attack on contact and never flee. Thump the ground near their nest entrance and they will swarm towards you. They seem to be able to smell humans from metres away, and will also react to a shadow passing over them, although they do not seem able to ‘see’ humans in the way that Camponotus fulvopilosus is able to. 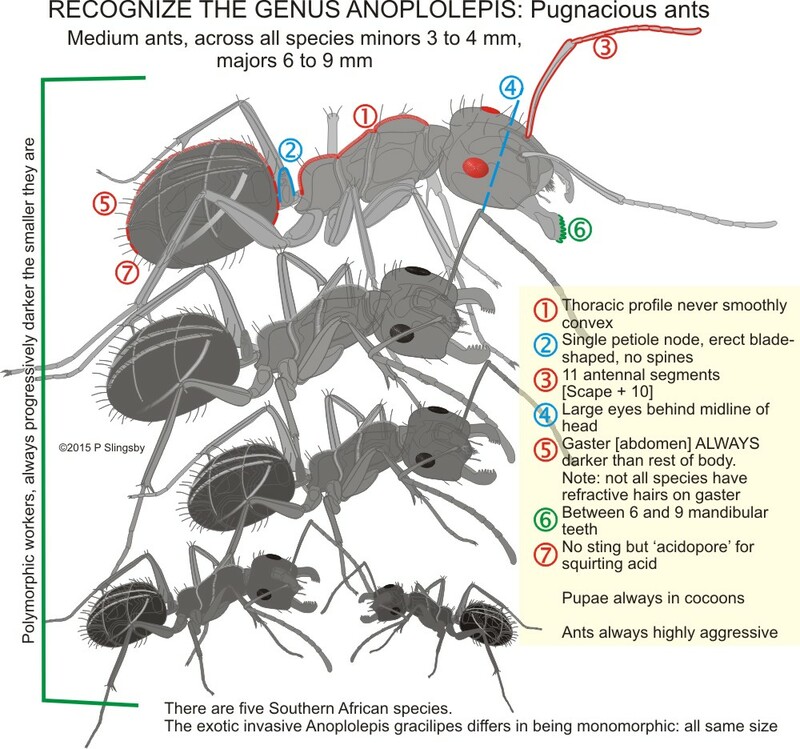 The two most important local species are Anoplolepis custodiens, the Large pugnacious ant, and A. steingroeveri, the Small pugnacious ant. There seems to be quite a lot of variation in each ‘species’, and once again the taxonomy of these small animals is confused. 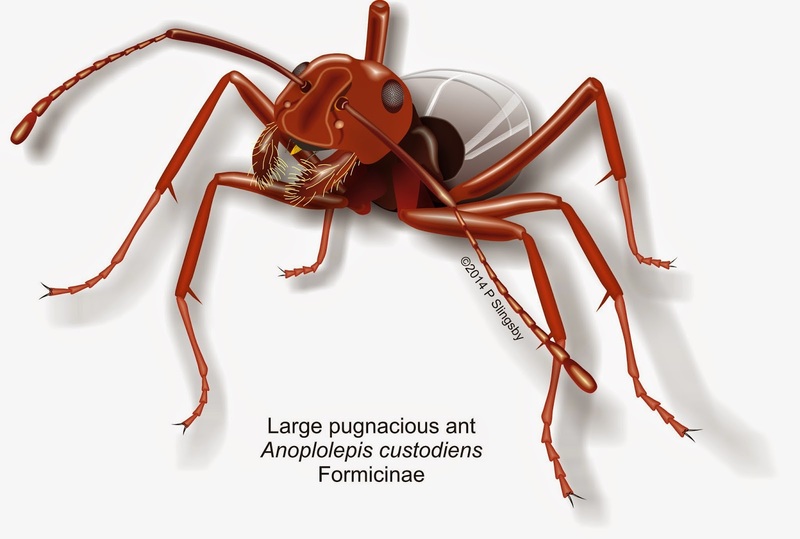 The Large pugnacious ant is very much a problem animal in crop lands and orchards, where it introduces and tends to all sorts of invertebrate pests. 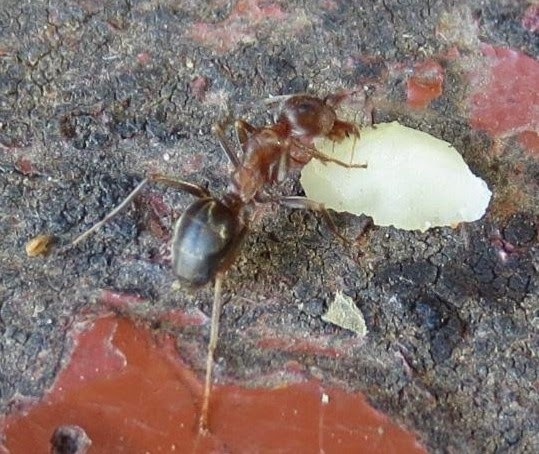 The ant is polymorphic [workers of many sizes, from about 4 mm up to 8 mm]. They are well-known for the pattern of refringent silvery hairs on their gasters that refract light and give them their unmistakable appearance. Although present in different sizes there is not much difference in overall shape, unlike in Camponotus or Pheidole. Oddest ant behaviour I have ever seen. We stayed at Bergrivier outside Loerie [highly recommended!] 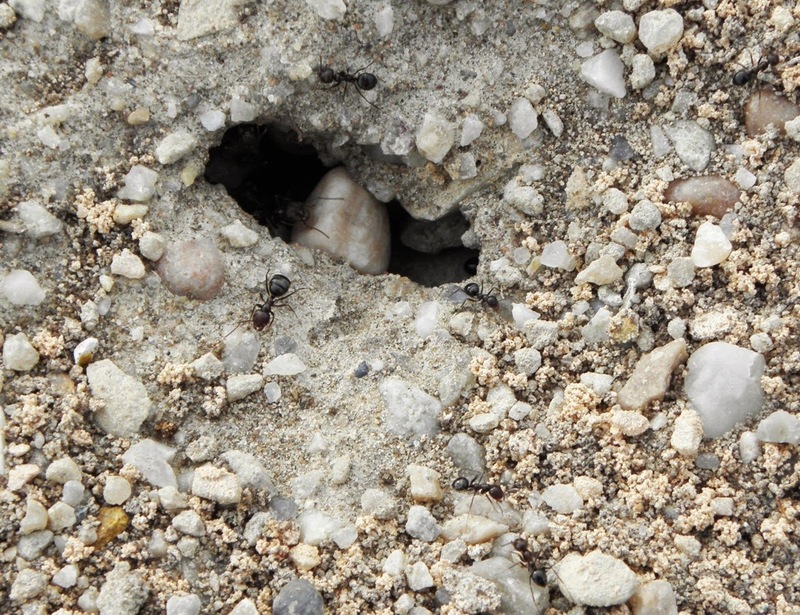 There were several nest entrances in the dirt track outside our cottage, typical of Anoplolepis, and clearly these were all entrances to the same nest, as the ants from different holes interacted freely without hostility. Until about 5 pm their behaviour was normal, with much toing and froing, ants arriving with full gasters, carrying small insects etc etc. At about 5 a dramatic change occurred. 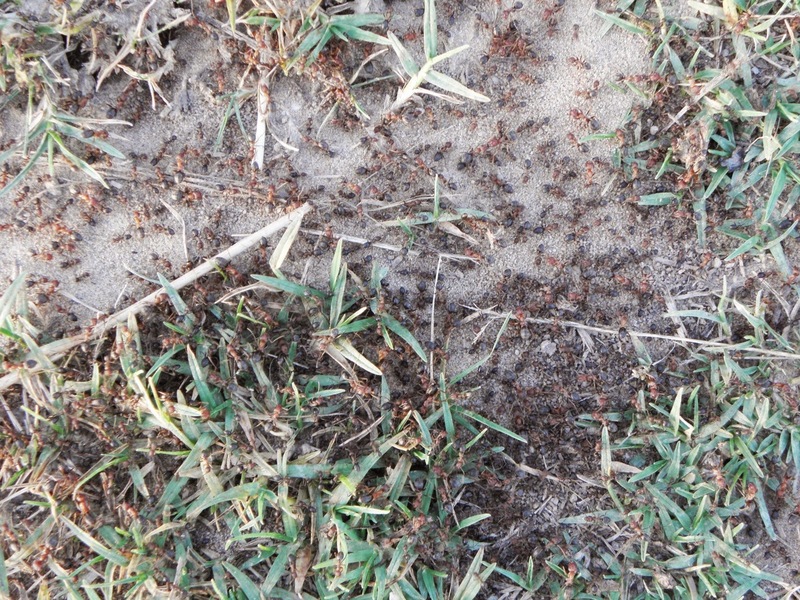 A large number of ants started to congregate in a patch of bare earth and grass about 30 cm across. Whereas all the ‘normal’ ant activity was pretty rapid, being a hot day [32°C], the congregating ants moved quite slowly, meandering around the patch in a manner strongly reminiscent of Victorian couples perambulating around the lawns of Hampstead Heath. This aimless wandering gradually concentrated into a patch not more than about 10cm across in a grassy area, containing many hundreds of ants. It was a hot evening with rain threatening, and initially I thought that the behaviour might be preparation for the release of alates, or winged males and females. These reproductive ants are typically released by many species in pre-rain conditions, when they fly away to mate and found new colonies. However, there was no sign of winged ants. When we went to bed at about 10 pm hundreds of ants were still milling about on the same patch of grass, to no obvious purpose. In the morning very little had changed. Of about 15 nest entrances, only two were active, with streams of ants still visiting and leaving the patch; the other entrances were devoid of any activity, which is the norm in the early morning. It was cold [14°C] and the ants were moving slowly, but still actively. Before sunrise there were a few instances of some ants trying to persuade others to return to the nest, and this was the first time I have ever seen Anoplolepis carrying each other in a similar manner to most Camponotine ants. Sadly it was too dark to photograph that. After sunrise the mysterious activity continued at a heightened pace. I confess that eventually my simian imperatives took over, and like any good baboon, monkey, small boy or venerable scientist I could no longer resist blowing some hot breath onto the seething patch of ants. That brought a new surprise. Blow onto any ‘normal’ crowd of Anoplolepis and after an instant of confusion they will swarm towards the source [you] with jaws agape and menacing intent. In this case there was a similar moment of brief confusion, and then the milling around and swarming up and down the grass blades simply continued as though nothing had happened. To all intents and purposes the ants, I realised, were behaving as though drugged. We left at 8:30 and nothing had changed. If anyone can explain this strange behaviour I would love to hear from you. The ants were not attacking each other or any other creature, nor were they obviously feeding, licking the ground or grass, etc etc. Occasionally a grass blade or small twig was picked up, then dropped, in a completely random way. The Small pugnacious seems to be more widespread in variety of fynbos habitats than its larger cousin, and is even found foraging in the coastal littoral zone. Its role as a seed-disperser of thousands of fynbos species, especially many of our larger and most charismatic Proteaceae, is absolutely vital. It was previously thought that these ants preferred sandy, dry habitats in which to nest. However, Amida Johns reports that they are also the major distributors of rare high-altitude species such as Orothamnus zeyheri and Mimetes stokoei. These members of the Proteaceae only occur in wet but well-drained seeps where there is little or no ‘open ground’ between the rich growth of plants. In these habitats it seems that the ants nest in the marginally-drier restioid tussocks that are a feature of the habitat. The Small pugnacious ant also has a single row of refringent hairs on the gaster but they do not reflect light as they do in A. custodiens, and the ants generally present as dark brown, or reddish in bright light, and quite shiny. They are considerably smaller than their cousins, ranging from about 3 mm to 5+ mm. Both species nest in the ground and may form large, connected colonies with more than one queen (AJ Prins reported that they do not do this, but we have found plenty of evidence that it is indeed the case). 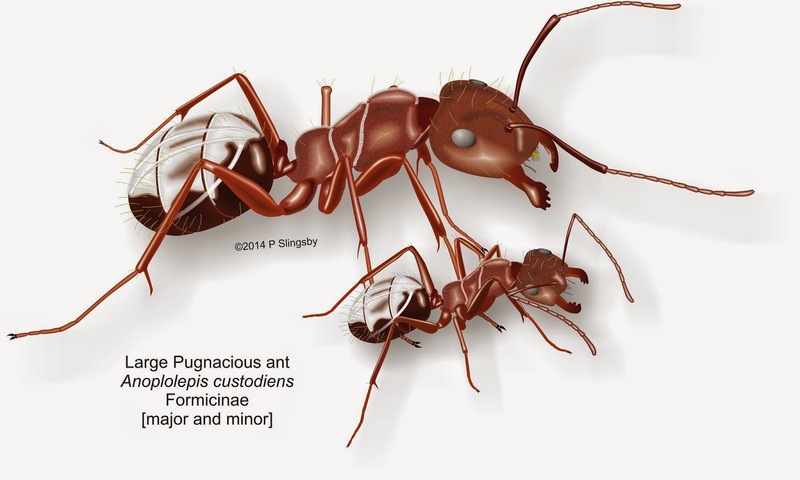 Pugnacious ants range out from their nests in search of food. When food – insects particularly termites, fallen seeds, small dead vertebrates etc. – is found they rush around secreting alarm pheromones that alert their sisters. 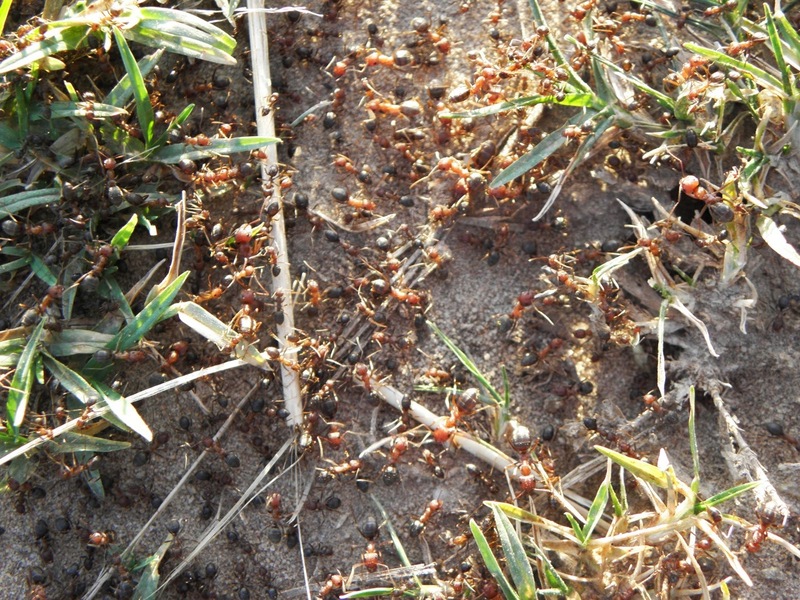 Within minutes large numbers of ants seethe out of the nest towards the prey. 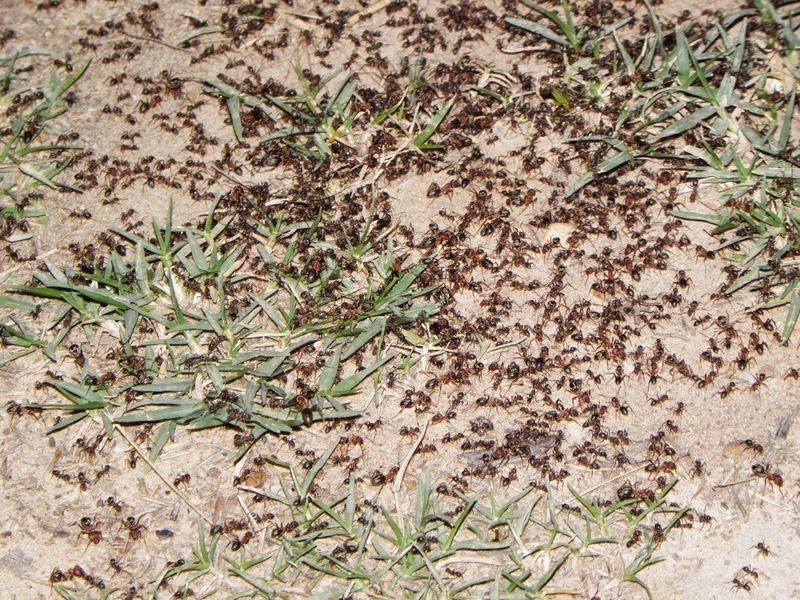 If the food source is large the ants may form trails to and from it. Despite their intense aggression, pugnacious ants are unable to withstand the very much smaller Argentine ant, and are always eliminated by it, with subsequent potential negative effects upon the distribution and successful regeneration of many fynbos plant species. 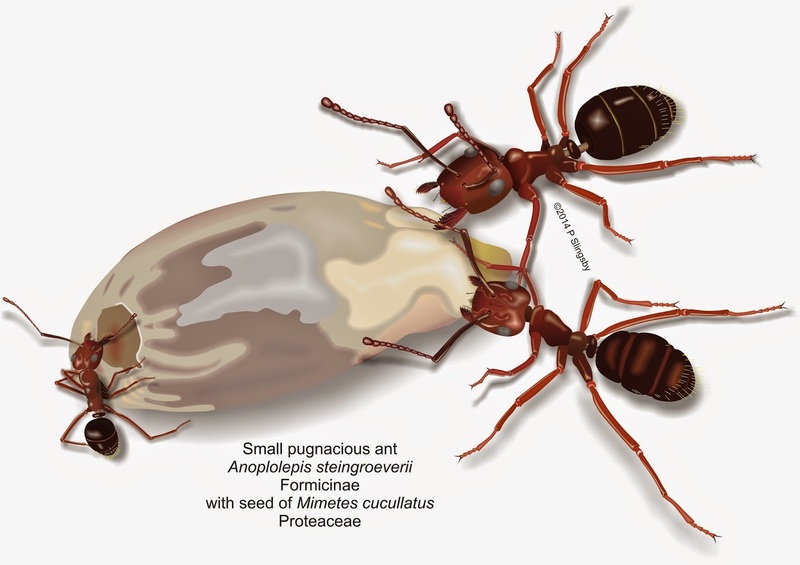 However, pugnacious ants seem to have an intense antipathy towards their fellow indigenes, Crematogaster or cocktail ants, and if they encounter a cocktail ant nest they will attack it and they will eliminate every single inhabitant thereof. It’s not a pretty sight, but don’t forget that humans do that to each other too, and they are the same species, unlike the ants in this murderous tale. Ants of Africa reports that this extraordinary species is ‘Known only from alate sexual forms and lives as an inquiline in the nests of Anoploplepis custodiens (Prins, 1982)’. In plain language this means that no workers have ever been found; winged females and males live happily in the nests of A. custodiens where they seem to live as sort of pets of their hosts (Latin inquilinus means ‘lodger’ or ‘tenant’ and the term is applied to an animal that ‘lives commensally in the nest, burrow, or dwelling place of an animal of another species’ – Antwiki). We have not illustrated it; the winged females are almost identical to those of their hosts, while the males are smaller and paler. The species can apparently not survive without its hosts. This aggressive invasive ant has the potential to become a serious threat. Although it is thought to have originated in Africa no one seems really sure where it originally came from. What we do know is that habitats invaded by this ant are in serious ecological trouble. The ants have invaded many of the Pacific Ocean islands where they have eliminated swathes of the local insect fauna, and even small birds and other vertebrates. Largish [6 – 7 mm], they are long-legged and very fast runners, and they have learned budding to form huge connected colonies. They seem to spread mainly through the movement of shipping containers where they favour refrigeration units with their warm engines. They are also perhaps uniquely able to feed upon scarcely-defrosted frozen food. They literally spread out from ports and harbours and have been found in Table Bay and at Kalk Bay, Gansbaai and at Knysna in the Western Cape. Fortunately they have disappeared from Kalk Bay harbour and it may be that if their numbers are not large they are unable to withstand Argentine ants. In 1922 Arnold wrote “I have some examples ... of this race before me ... Apart from the colour, which is a pale straw yellow, a more abundant and more exserted pilosity here and there, it does not appear to me to be more than a very slight variety [of Anoplolepis custodiens].